Package Content:1x Locket Pendant, 1x Chain Necklace, 12x Dyed Lava Rock Stones. 1x Gift Box and Bag! 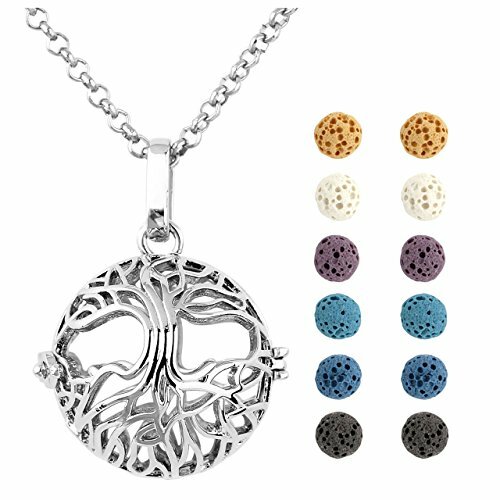 EXCLUSIVE DESIGN Tree of Life PENDANT - The Locket is a Tree of Life designed locket-style is professional for your Aromatherapy,No more need to carry your big bulky diffuser with you. Now you can simply WEAR your personal diffuser around your neck and take advantage of the benefits of essential oils all day long! 6 COLOURS LAVA STONES(size approx 6mm-7mm) - This reusable lava stone provides the best way to diffuse essential oils on the go. Not only does it give the necklace a great look, making the antique silver stand out, but it is a porous material that will hold the oil for hours. It holds the oil longer than the traditional leather discs or poms. We include white,black,purple,sappire blue,blue,yellow 6 colors lava stones. Not the same color to give you a different mood. SIMPLE & EASY TO USE - The pendant opens from the top like a locket and is specially designed to hold our lava stone. You simply add 1-3 drops of your favorite essential oil onto the lava stone and your ready to enjoy your personal diffuser. Qty:1pcx Tree of Life Locket,1pcx Necklace Chain,12pcx Lave Stones. Comes with a Elegant Black Gift Box and Drawstring Bag! Makes the Perfect Gift for Anyone Who Loves Essential Oil & Aromatherapy.